Sea Tac Sweeping Service was founded in 1973 and services several counties, including, but not limited to, King, Pierce and Snohomish Counties. Sea Tac Sweeping Service is licensed, bonded and insured and is incorporated with the State of Washington. Sea Tac Sweeping is also licensed to do business in over 15 cities in the Seattle area, including, but not limited to, Bellevue, Burien, Kirkland, Tukwila, Puyallup, Federal Way, Renton, Kent, Mercer Island and more. 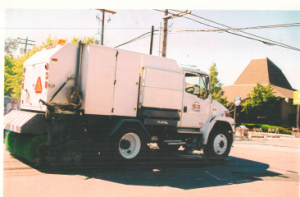 Sea Tac Sweeping Service specializes in *Construction Cleanup, *Commercial Sweeping *Street Sweeping, *Pressure Washing, *Fleet Washing, *Parking Lot Cleaning *Dust Control, and *Snow Plowing Services and provides these services to over 350 corporate customers, with the scope of work varying to meet the customers’ needs. We have the specific, well maintained vehicles and other equipment to accomplish any job assigned, and are always able to produce high quality service to our customers. All services are available 24 hours a day, seven days a week.